"... We are not given to uncritical boosts.... But it is difficult to write with moderation of the work of Johnnie Ramsay. His sleight of hand is unexcelled, perhaps even unequalled. Performers who know all there is to know about the Cups and Balls are not merely puzzled, but utterly baffled by Ramsay's presentation. His Cap and Pence is a masterpiece of artistry.... It is not that he is always "one ahead": he must generally be half-a-dozen ahead.... His misdirection is perfect. Every action is perfectly natural and fully accounted for... If it be true that art consists in the concealment of art, then John Ramsay is the finest magical artist that we have seen...." - ABRACADABRA (30th March, 1946). "... Who hasn't heard of John Ramsay and the way he outdistances everyone with his close-up thimble and coin work?" - ANNEMANN, Theo (The Jinx). "... If you haven't seen John Ramsay, you haven't seen one of the greatest exponents of sleight of hand..." - CHRISTOPHER, Milbourne (The Linking Ring). "... John Ramsay ... his tricks with small objects are the best I have ever witnessed... His misdirection is perfect... His trick with half-crowns and a small cylinder left us guessing, and we are still guessing..." - HULL, Ralph W. (From a private letter addressed to his friend. J. Crosland, Bately, England). "... When you know the man, and study him closely, you are absolutely amazed at his tremendous ability..." - LEVANTE, Les (From The World's Fair. 13th May, 1939). 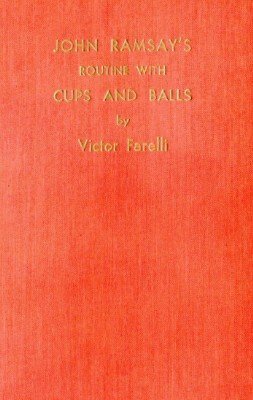 This is likely the best book on the classic Cups and Balls effect. It includes next to a detailed description of John Ramsay's routine historical notes as well as a cups and balls bibliography. Includes photos and illustrations. 1st edition 1948; original 101 pages; PDF 85 pages.